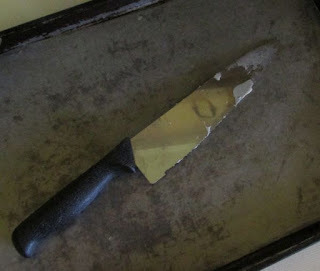 Well, another sentimental kitchen item bites the dust, and I killed it. I know nothing lasts forever, but I didn't think it would go down like this. I have not been so traumatized since the demise of my electric frying pan three years ago. 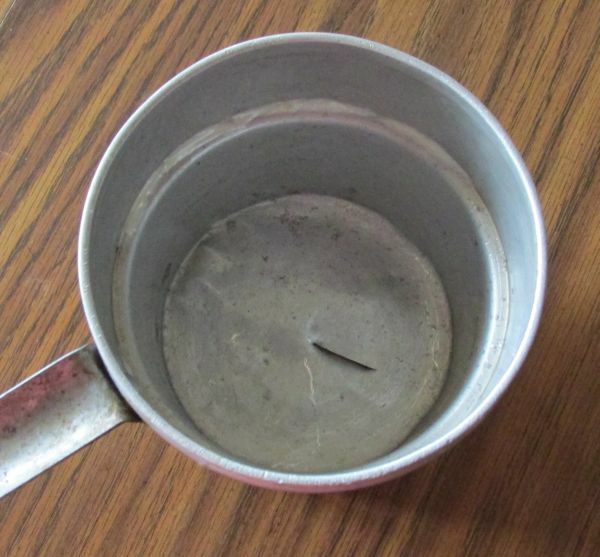 This may seem like a silly thing to be upset about, after all, a double boiler is easily replaced. But this was not an ordinary double boiler. This item has been with me since I left my parents' house at the tender age of 18, with nothing to my name but some clothes and an old car. I had rented a small, unfurnished house, and my grandparents, who had little or nothing as well, set about helping me get started with "adult life." They scoured garage sales and auctions, and before I knew it, I was set up with a bed, a washing machine, my grandparents' old silver kitchen table, and my great-grandparents' old couch and chair. I made a purchase for myself as well - a color TV, from a garage sale, for $2. What they didn't tell me was that it had only ONE color - green. But I digress. I also had a kitchen full of various gadgets. I saw the double boiler and had no idea what it was, so I stored it in the back of the cupboard with the hand-held potato masher and other mystery items, and went on with my life. Eventually though I discovered my "culinary side" and I used the double boiler frequently. 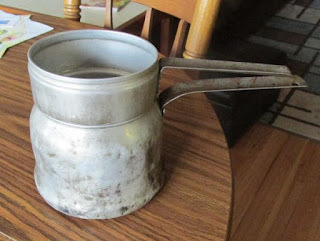 I often thought how well-made things used to be, that I could have a second-hand double boiler for 35 years and it was still awesome. I loved that thing - it had a smaller than typical footprint, and had a deep well, perfect for dipping candies at Christmas. And it reminded me of my grandma, and how she lovingly took what little she had herself and put together a functional kitchen for me. I can honestly say I never used it without thinking of her. - and managed to even pierce the bottom of the lower pan as well. Is that "Taps" I hear? I'm going to keep that knife in mind if I ever have an intruder in my home. Of all the days of the year, the day before Thanksgiving is one of my favorites. I usually spend it in the kitchen, cooking and baking, alone with my thoughts and the wonderful smells wafting through the house. Those smells invariably take me back to childhood Thanksgivings - walking in the door at Grandma and Grandpa's, and going up the stairs to the sounds of Shorty barking and posturing like he was going to attack, all from the safety of Grandpa's lap in the recliner. And opening the door at the top of the stairs to those wonderful smells - roasting meats, and buttery potatoes, and the fantastic gravy Grandma made from cream of celery soup. A few more steps, and we'd have to endure the torture of seeing the plates with the slices of pies of various kinds, all topped with whipped cream, sitting on the buffet. It was as if they talked - "I'm going to call your name all through dinner..." but the sight of all Grandma's wonderful masterpieces spread out on the table usually got my attention back where it belonged. 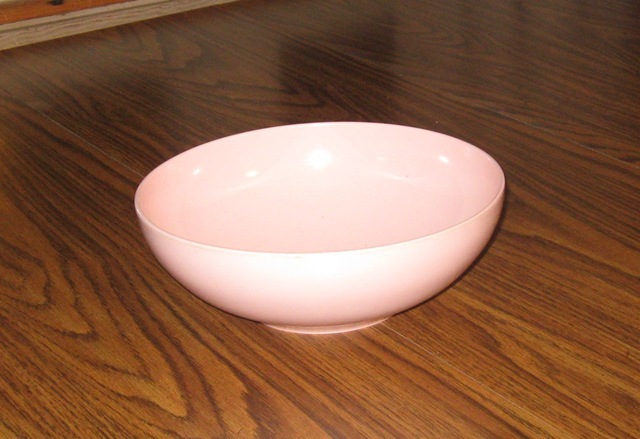 Seeing the two pink bowls was always a treat, and still something stirs in my heart and my palate when I bring mine out of the buffet for our own holiday dinners. I hope my own grandchildren come through my door with anxious anticipation, enjoying the sights and smells of the Thanksgiving table, and that they will hold onto those precious memories throughout their lives. 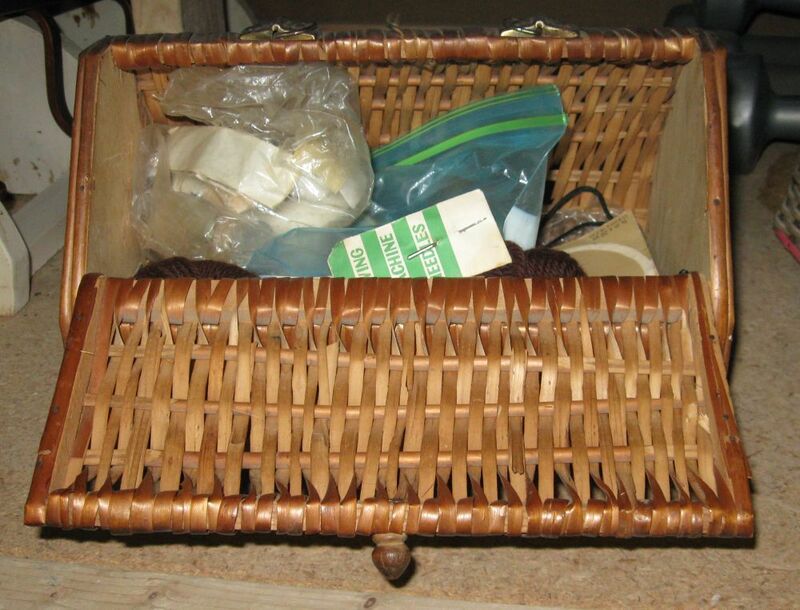 Inside these baskets were many packages of rickrack and other old trims, most of them still unopened, in the original cellophane packages. I can certainly use them for my own sewing projects, but something just seems wrong about opening them up and sewing with them. I guess for now Ill just put them back where I found them and think about it. 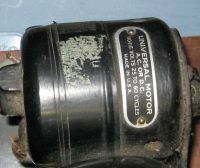 I'm not sure an old package of bias tape or piping is worth much, but seeing that old label is like a trip back in time. 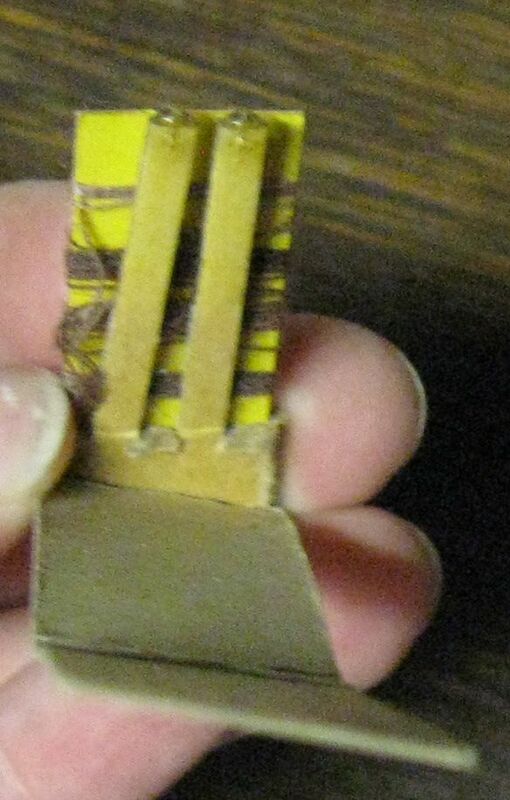 There were two of these little rulers from the "Medical Sickness Society" in London. I don't know how old these rulers are or where they came from, but this business appears to be a financial services business, at least in 2012. 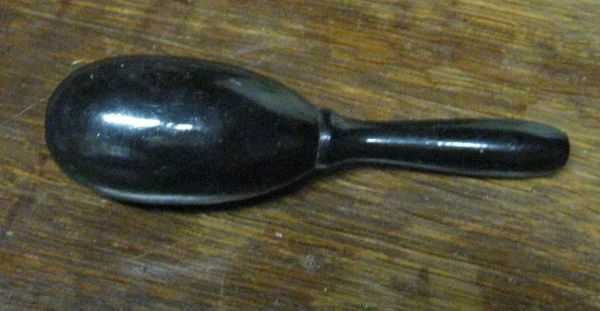 When I first found this item, I thought it might be a maraca (hey, I've found stranger things in my basement!) but turns out it's my great-great-grandmother Nettie Graves' darning tool. Had it not been labeled as such, I never would have known. I would have kept trying to shake it and get some sort of rhythm going. This little mending kit must have been a promotional item from The Lampe Market in Huron, South Dakota. The inscription reads in part: 1889 - MEATS - 1927. 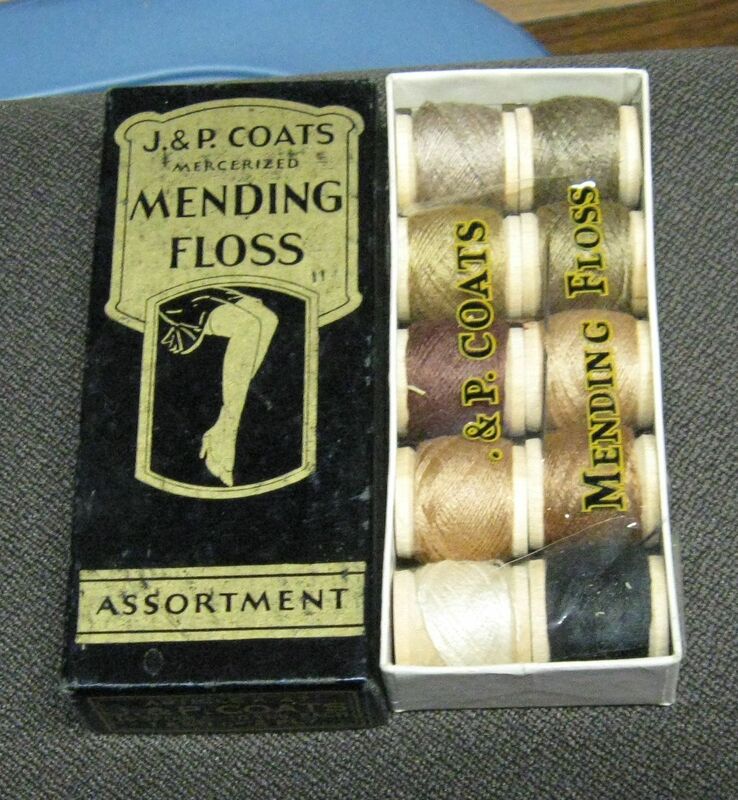 Since the market was still in operation in 1930, I'm guessing this mending kit was made and distributed in 1927. 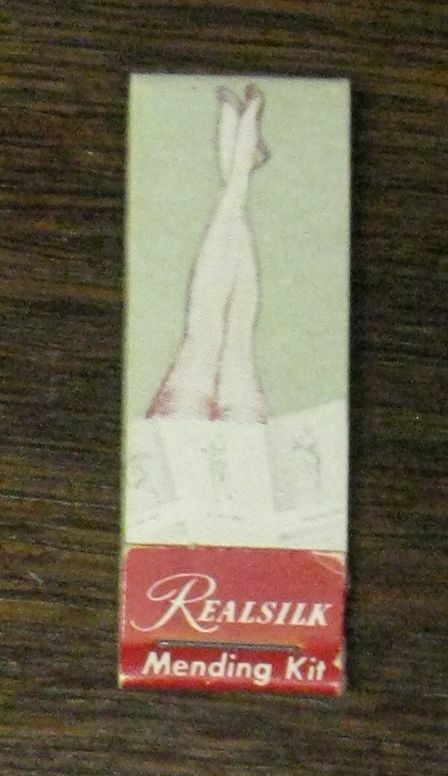 Another promotional item was this shoe horn from Osborn Clothing Company, also in Huron. Oddly enough, I do remember as a child my grandmother showing me how to use a shoehorn she kept in her sewing basket, perhaps this one. While the Lampe Market had closed shop before my time, Osborn's is still in business. 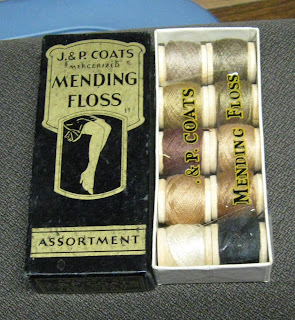 In Part 2 of this series, I found a small mending kit for silk stockings; today I found a full-fledged mending kit, with 10 different shades of floss. The box still has cellophane covering the bottom part. 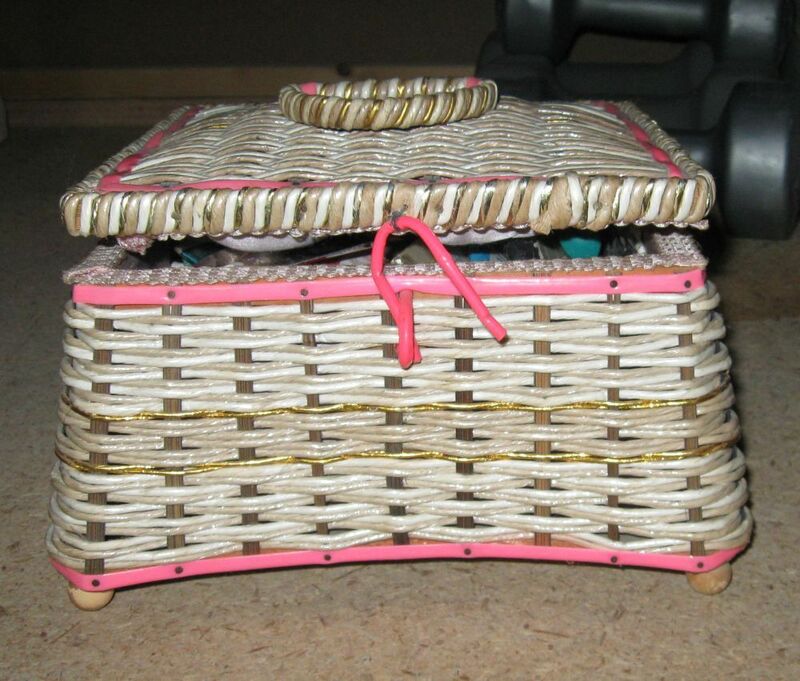 And this item... 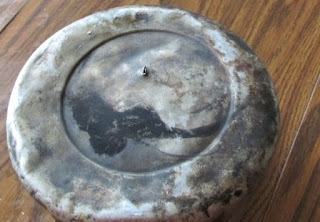 I was reading a blog post by Nancy, owner of My Ancestors and Me, at her other blog, Joy For Grace, on the topic of "Unsewing." This looks like the perfect tool to use in "unsewing." One end has a thin blade, the other a sharp pick, and a handy cap for each end. It's only stamped with "Rip 'n Pik." Looks so useful I almost hated to pack it back up! Looks to me like a "Million Dollar Idea" if someone would brings these back into production. 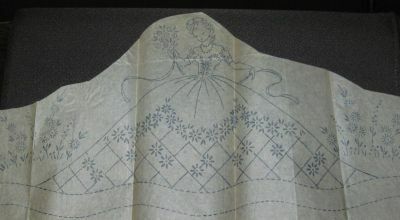 I found numerous iron-on transfers, from silhouettes to cowboys to graceful ladies, flowers and butterflies. And then there's Barnacle Bill. According to Wikipedia, "Barnacle Bill the Sailor" was a bawdy drinking song, of which the first printed version appeared in 1927. The song inspired a Betty Boop cartoon and two movies. In the first Popeye the Sailor cartoon, Barnacle Bill was used as the inspiration for what would become the Bluto character. Wikipedia furnished the lyrics of the song, and since this is a family blog, I won't repost them here! Nonetheless, I was a little surprised to find Barnacle Bill among the iron-on transfers! 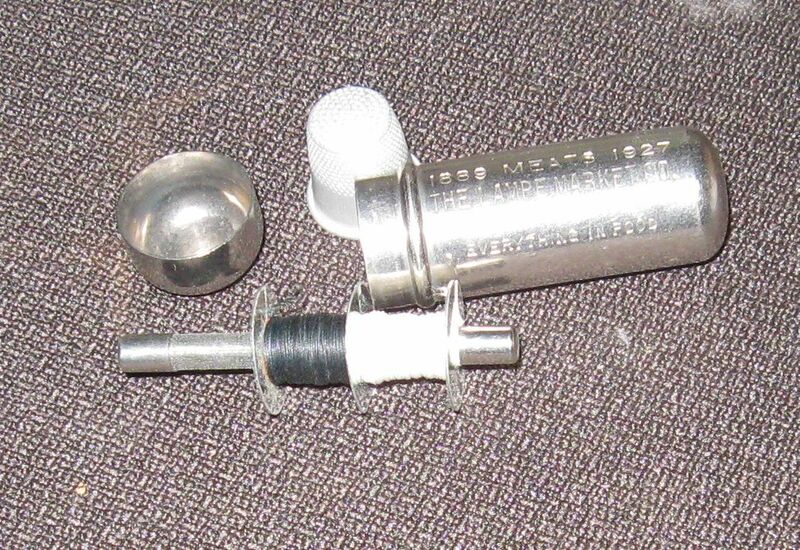 Who remembers bobbins like these? These are a set of "Sta-Tied" braided elastic shoelaces. They are thick, and quite stretchy. I can't imagine these wearing out any time soon... The Nov. 28, 1958 issue of the Mason City, Iowa Globe-Gazette features an article on the Sta-Tied Lace Co. and their new shoestring, said to be most ideally suited for sports footwear. The University of Iowa and Notre Dame University athletic departments had already begun using their laces. 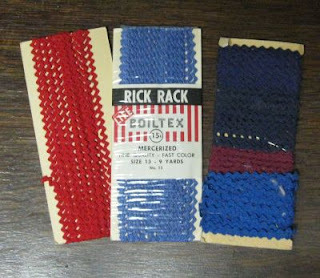 Tiny rick rack! Never seen it this small. The directions say to "Tear off Run-Arrestor Wand like any match book stick. Moisten with tongue and touch both ends of stocking run. Mend before washing." Included are mending threads of many different shades. This item was manufactured by the Real Silk Hosiery Mills, Inc. of Indianapolis, Indiana. That's all for now, but more to come. This morning I brewed up a pot of the delicious Pecan Pie flavored coffee my son brought me, drank a couple of cups, and the next thing I knew I was down in the basement cleaning and going through things! I don't know what was in that coffee... After an hour or so of sorting through the usual boring things (clothes the kids had outgrown, half-finished craft items, piles of computer paraphernalia), I came upon Grandma's old Singer sewing machine that Grandpa gave me after her death in 1991. 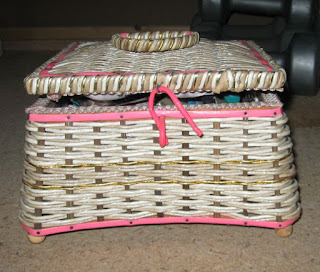 It sits inside its beautiful wooden and wrought iron sewing table, tucked down in its little cubbyhole, with all kinds of stuff piled on top of it. Today, I cleared it off and brought the machine up for a good cleaning, and proceeded to go through the sewing table drawers. Some of the items inside belonged to my grandmother, and some I picked up at garage sales. All neat stuff. I don't remember Grandma using this machine - I think it was the 1950s when she got a new or newer Singer with a "gas pedal", the same machine I learned on. I was 12 years old before she'd let me use electricity - until then, it was crank, crank, crank. Naturally, she told me one of her little white lies about knowing a girl who sewed too fast with electricity, and ran the needle right through her fingernail and out the other side. I believed it then and was horrified, and still think of it while sewing occasionally today. But Grandma, if you're listening, I'm on to you now. But I'm still scared. And I never go fast. By that time though, this machine was tucked away in her basement, with stuff piled on top of it, much like it's been at my house for the last 21 years. I remember her mostly patching Grandpa's clothes and making blankets, not so much sewing clothes except for our Barbie dolls. 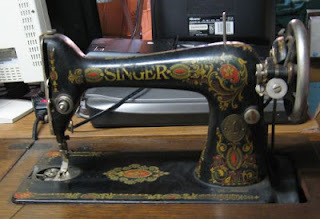 I checked the Singer website to see if I could find out when this machine was manufactured, and it was in 1920, which was a bit of a surprise. I didn't think it was that old. 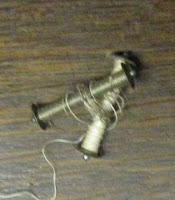 The first thing I found was tucked down on the bottom of the table - and old Climax sewing machine that I had picked up cheap at a garage sale many years ago. 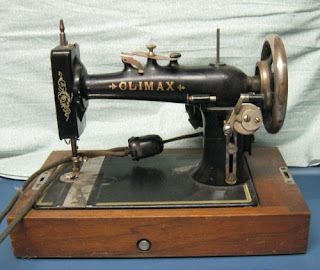 The Climax Sewing Machine Company was a sub-company of New Home. 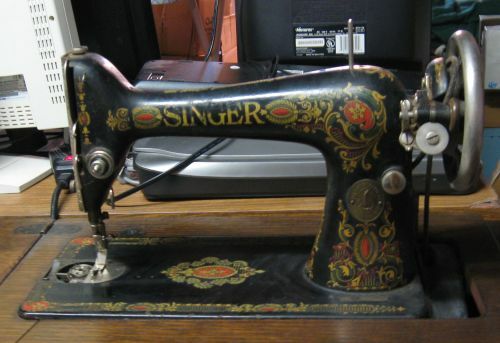 Singer bought out the company in the 1920s. This machine has a motor added on to the back of it. I will save what I found in the sewing table drawers for the next blog post or two. A nice glimpse into the past, if I do say so myself. "Tell me that story again, Grandma," my four year old granddaughter Alyssa pleaded. "Which one?" "The one about the boy who fell in love with the pretty girl," she replied. Oh yes, that would be the story of how my grandfather, Adolph, met my grandmother, Agnes, in Norway. She loves the story about how this 14-year-old boy and his father, Andreas Larsen, went inland to grind their grain, and were caught in a bad storm. 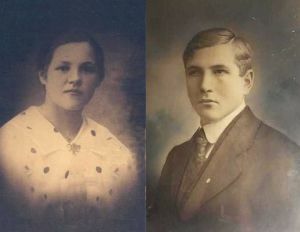 They sought refuge at the farm of Justin Frendal, and it was then that Adolph first met Justin's beautiful daughter, Agnes, and could not get her off his mind. Some time later, Adolph accompanied his father to the Frendal sawmill to cut timber, and caught Agnes' attention in return. 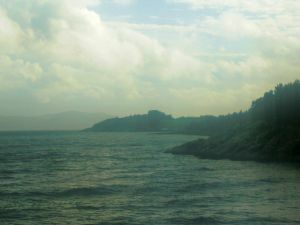 As was the custom at that time in Norway, Agnes was hired out to another family to help with the household work, and oddly enough (or maybe not so odd), she ended up in the household of Andreas Larsen, and the rest is history - family history. 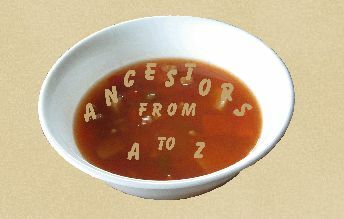 Thanks to the remembrances of uncles, aunts, and distant family overseas, we are fortunate to know some of the personal stories and events that breathe life into the bare facts of this couples' existence. Like most little girls, Alyssa loves the wonderful romantic element that is the core of the story, but without realizing it, she is learning something of Norwegian geography and customs. After telling her this story several times, we looked at pictures of the fjords; we looked at maps showing where the Larsen farm was in relation to the Frendal farm and the sea that separated them; we learned what Agnes' life was like as a girl growing up in a different land. She learned what the immigration experience was like as Adolph and Agnes left their families and homeland, and the simultaneous hope for the future and the sadness that Agnes would not see her family again. She has seen pictures of the Oscar II, the huge ship that carried the young couple to the land we call home today. But the best part for me was watching her eyes open wide when I told her that her Grandpa Wally, whom she knows well, was their little boy. Suddenly the fairy tale prince and princess became quite real, and best of all, they became HERS. In all this, we need to be careful to keep it truthful. I have to admit, there was some disappointment when I discovered that my German ancestral grandfather Nicholas, did not meet his beautiful French bride Dorothea Francine, while fighting in a war in France. Nicholas, in fact, had no military experience - he was a widower with two young boys, and "Dorothea Francine" was actually Franken Dorothea, a poor German woman with a little girl. However, they had their own stories of adventure, determination and struggles with the German government, and building "something" from "nothing." Looking at their lives and challenges in the context of what was happening in their personal lives, their country, and in the world, makes for an interesting story in itself. There is no need to embellish the facts to make their story an interesting one. Of course, not all family stories are going to appeal to all children, but hopefully the realization that Adolph and Agnes were Alyssa's people, and they have an interesting story, will lead her to wonder about her other ancestors as well - Martin Adams, the Revolutionary War Patriot who was a drummer just like her grandpa; Rebecca Lair, the poor widow with nothing who ended up being a landowner; John Adams, the gold miner in the California Gold Rush; Grandma Lisa, who experienced the Nazi invasion of Norway firsthand, among others. Knowing that these were her people, and their blood flows through her veins will hopefully create a thirst in her for more.